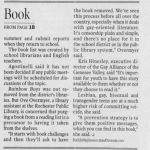 Upon the publication of Rainbow Boys in 2001, the United States was in a time changing perception of LGBT issues. Driven by highly-publicized events such as the brutal murder of a young gay man named Matthew Shepard, society began a shift towards the acceptance and normalizing of LGBT existence. 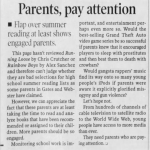 Similarly, the AIDS and HIV crisis was continuing to garner attention. The increasing prevalence of LGBT issues in the public sphere allowed author Alex Sanchez to offer a perception of LGBT life that continued to increase awareness and empathy among both straight and LGBT populations. Though only a dozen years have passed since the challenge to Rainbow Boys, society’s perception on LGBT rights has continued to dramatically shift. 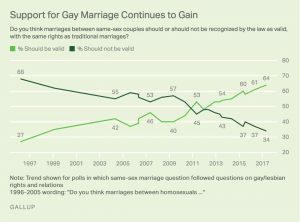 Most notable and well-measured is the changing stance on support of gay marriage, as Pew Research Center reports, support for gay marriage has risen from 35% in 2006 to 62% in 2017. Furthermore, support for gay marriage among White Evangelical Protestants (most closely matching Reverend Morse’s Baptist beliefs) has risen from 12% in 2006 to 35% in 2017. While these polls on gay marriage do not necessarily correlate to acceptance of LGBT adults or teens, it is reasonable to infer the time period in which Rainbow Boys was challenged made the issue more controversial than it would be today. A compilation of Gallup polls demonstrating changing beliefs on gay marriage. Mitchell, Travis. “Changing Attitudes on Gay Marriage.” Pew Research Center’s Religion & Public Life Project, 26 June 2017. 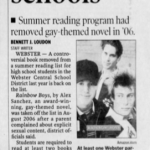 When Alex Sanchez wrote Rainbow Boys in 2001, YA literature was nearly void of meaningful, authentic portrayals of LGBT life, so it is understandable that Sanchez focused on the hardships his gay protagonists faced in terms of coming out and bullying. 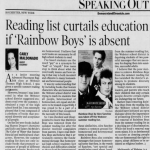 While sustaining some criticism from a variety of interests, Rainbow Boys was generally seen as a groundbreaking opportunity to normalize the struggles of gay life, with commentary like that from Kirkus review which called the story “thought-provoking and informative for all young adults.” Though 17 years later, as more and more gay teens publicly live “normal” high school lives, the need for a portrayal focused so thoroughly on the very issue of being gay has lessened. Now, YA authors write stories about teens who are applying to college, winning track meets, handling divorcing parents, and also happen to be gay. 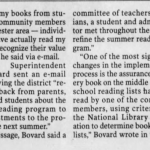 This shift away from complete focus on suffering as a gay teen reflects the increasing acceptance for LGBT youth, and also renders Rainbow Boys somewhat “outdated,” as Webster librarian Trish Warren put it. 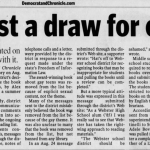 Specifically in the Greater Rochester Area, a complex history with LGBT issues exists. 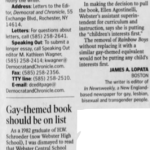 As the nation was grappling with sharp change on perception of LGBT life in the early 2000s, Rochester and suburbs like Webster were no exception, with challengers like Reverend Morse attacking Rainbow Boys with an array of supporters, but also supporters of LGBT advancement like the 18 people who wrote or called to Webster Schools to complain after Rainbow Boys was removed. Complicating matters is the higher levels of Catholicism in the Greater Rochester Area, as the 26% percent of the population that identifies as Catholic outranks the national average. Polling reflects less favorable stances on LGBT issues and gay marriage among Catholics and Baptists than mainline Protestant Christians. 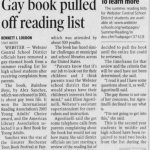 Overall, though, the historic lack of challenges to LGBT-themed material (besides Rainbow Boys) is indicative of the Greater Rochester Area’s acceptance of LGBT people, as the city received a score of 100 for non-discrimination policies from the Human Rights Campaign each of the past four years. Masci, David, and Michael Lipka. “Where Christian Churches, Other Religions Stand on Gay Marriage.” Pew Research Center, 21 Dec. 2015. Mitchell, Travis. “Changing Attitudes on Gay Marriage.” Pew Research Center’s Religion & Public Life Project, 26 June 2017. 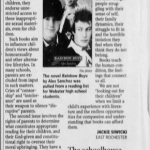 “Rochester, New York Religion.” Sperling’s Best Places, Sept. 2015.